From this Google Trend graph, it is quite clear that in the past couple of years marketers have started showing interest in “Buyer Persona”. Interesting thing is that soon after the spike in search for “Content Marketing”, the search interest for “Buyer Persona” also took off. Probably attributed to the importance of “Buyer Persona” for generating content relevant to different audiences. I’ll get straight to the point – Buyer Persona is the fictional representation of real people in the target market. These are the people who will be buying or influencing the buying decision-making process of the products and services sold by your company. It takes into account multitude of factors like their goals, job roles, responsibilities, values, fears, challenges and demographics. This post will focus on a the data available to a very early stage start up which has decent amount of traffic to the website/landing page along with social media engagement. Getting insights from customer interviews has been discussed in the second installment of this post. When companies sign up users for private beta, they always ask for at least one thing – the email id. If you are using landing page platforms like kickofflabs, you will be able to see data associated with each lead. Here is a publicly available image taken from kickofflabs website showing the social profiles of a lead. There are also other service providers like fullcontact and mailchimp, who can search data associated with email addresses. Jay Baer has written a detailed post on this topic and also gone on to describe how one can use Gmail, Facebook and Twitter to find out customer details without spending a dime. Now, fire up your spread sheet and start filling up the details about your customers taken from their social media profiles. Some of the important information are their current job title, job role, the company, company size and education (LinkedIn profiles are pivotal here). Unless you are a B2C company stuffs like gender, marital status and hobbies won’t be of much use. 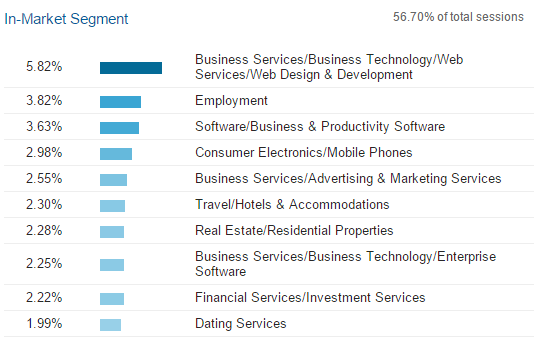 Using these data, find out what kind of companies (manufacturing, education, marketing agency, etc.) are signing up for your product, the job role/designation of the person signing up (VPs, founders, CXOs, Analysts). You’ll be able to figure out the background information of the customers where your product is able to strike a chord. You can take a step further by actually reading the blogs, posts made by the users to understand their problems, goals and obstacles. Now, let’s move to our next source. Inside “Audience” section, you will find “Interest” segment. It Categorizes the visitors in the top funnel of the purchase cycle and gives an idea on who the customers are. Whether they are music lovers or technophiles. This segment ranks website visitors in terms of the likelihood of purchasing a product or service in a specific category. 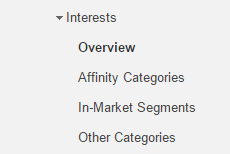 Unlike “Affinity Category”, “In-market segment” gives you users who are at the end of the purchase funnel. These are the refined categories of the visitors not present in the two categories mentioned above. Consider this category for possible partnership or collaboration. 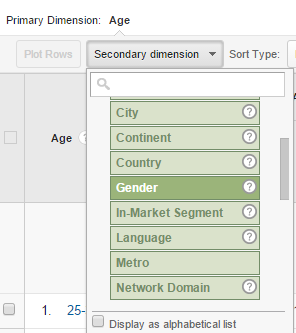 Demographic data can be accessed from the “Audience” section. This section gives insights in terms of gender and age. You can compare and contrast age vs gender with respect to conversion rate and find out which age group/gender converts the most. To do that simply add “gender” as secondary dimension in the “Age” report page. For example, an e-commerce site might see that 75% of the visitors are male and more than 50% of the total visitors are in the 18-24 age group. But, after adding gender as secondary dimension it might come out that – females in the 25-34 age group have the highest conversion rate. And there-by it can be considered that they are the most valuable target audience. Head over to “Acquisition” section and click on “Search Engine Optimization”, then on “Queries”. This essentially gives you organic search queries that draws visitors to your landing page. You will see a disappointing “not set” query owing to privacy settings of Google. But, the rest should give you a fair idea of the queries that applies to your target audience. Copy these key words to a spreadsheet and try to figure out the intent behind these queries. Use the insights derived from all the sections described above to devise a rough persona. For example – “founder of a small digital agency looking for an entry level CRM software”. The analytics provided by social media platforms can be used to further refine the target audience depending on how they characterize themselves. Twitter Analytics provides wealth of information about your account, tweets and more importantly – the audiences. Simply navigate to “Audiences” tab and you’ll see the top interests of your audiences (most important) and their demographics. This will give you a fair idea of what kind of content will resonate with your target audiences. 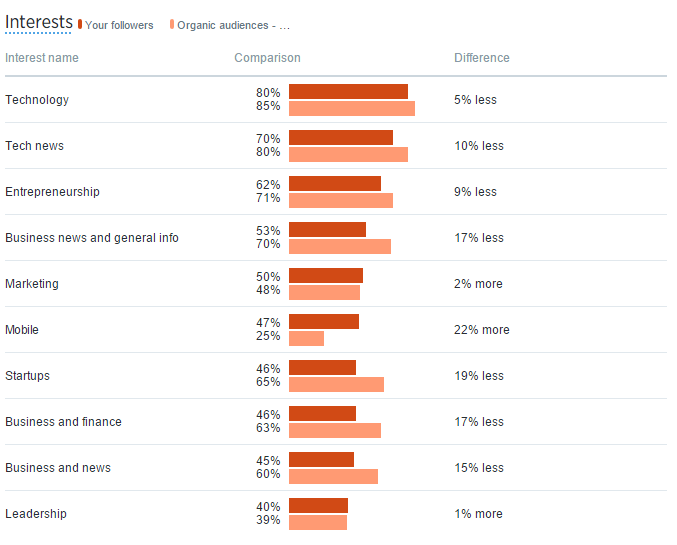 Another great thing is the ability to see and compare the interest and demography of the organic audiences(who don’t follow you, but have seen your tweets). 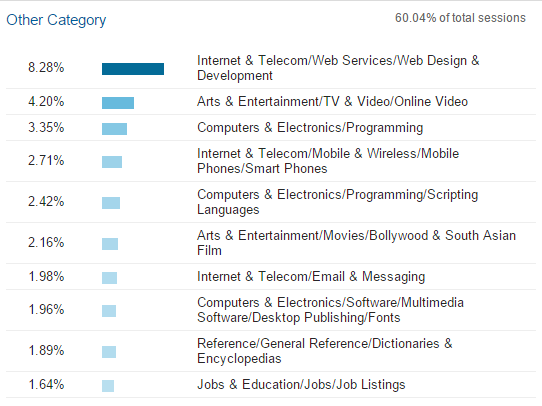 Also take note of the “Mobile Footprint” tab which has a section for “Device Categories”. It tells you the kind of devices your audiences use – from iOS, Android, Blackberry to Desktop and Laptop computers. This factor will also be helpful to determine various facets of the buyer persona. 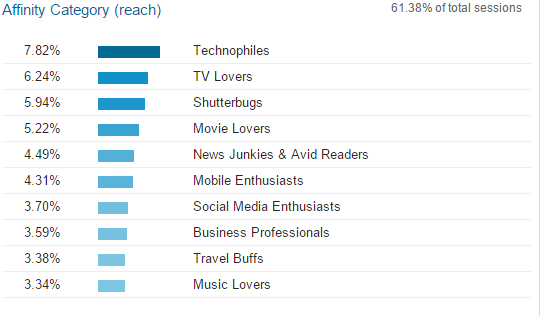 According to me Facebook Insights gives you least bit of information about the personality of your audiences. However access to the demographic data is relevant for crafting buyer persona. Go to your Facebook page and click on “Insights” button, then check “People” section. You will get to know the age, gender, location and primary language of people who have “liked” your page. Own sign up data and followers are actually limited and they don’t necessarily reflect the perspective of wider audience along with their challenges, goals and obstacles. Online forums like Quora, reddit and niche forums like TripAdvisor, inbound.org are quite useful to understand the pain points and gather various opinions. 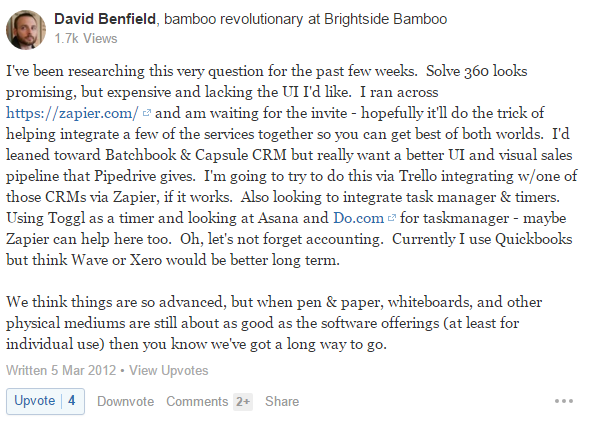 Here is an example taken from Quora where a business owner with a penchant for great design is looking for a way to integrate Project Management, CRM, time management and accounting app. 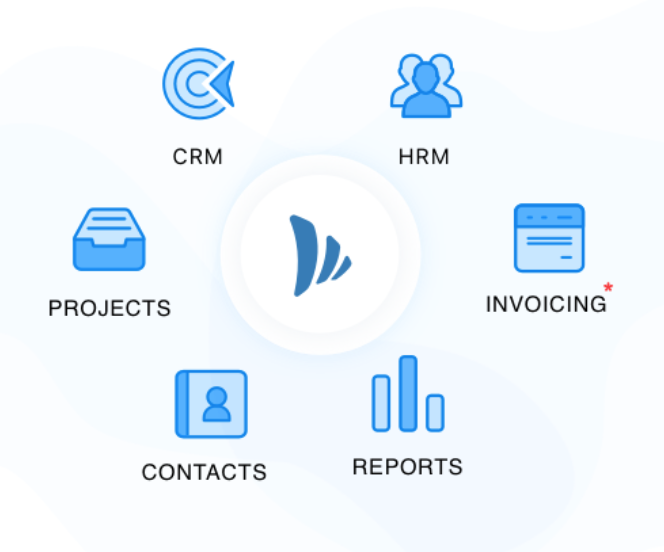 This is what TeamWave actually solves with its integrated suite of business apps. Now we’ll use the information gathered from the sources mentioned above to actually create buyer persona. Check out the following table and answer the questions to get off the ground. 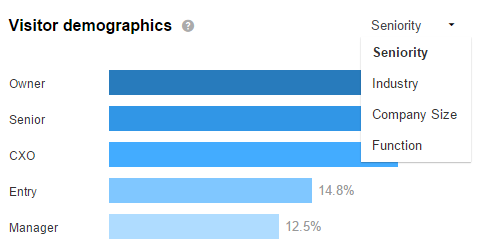 Demographics age? gender? location? income? Background job role? professional path? Objective tasks to accomplish? business priority? Obstacle what kind problems are they facing? Cause of Retraction what would deter them from buying your product? Marketing Message how can you help them overcome the obstacles and fulfill the objectives? The tactics mentioned above can get you started, but in order maintain a steady flight you would need a solid buyer persona. And that starts with actually talking to the customers, asking probing questions and deriving insights from the conversations. It’s an iterative process – personas become clearer as you discover more and more insights. In the second part (link at the top of this article) of this post we have discussed about some of the sample interview questions and covered what kind of insights would benefit the marketing team. Sharp buyer persona results in sharper marketing messages and in turn creates more conversion and engaged user base. We’d love to know about your experience with buyer persona creation. Tell us what has worked for you in the past and anything that you are looking forward to experiment with. If you liked what you read, please share and upvote us on GrowthHacker.com. ← Famous Predictions That Went Wrong!